“Motown – The Musical” is the story of Berry Gordy, the music mogul who founded the Detroit record label and with it launched the careers of Diana Ross, Michael Jackson, Stevie Wonder, Marvin Gaye, Smokey Robinson, and countless others who dominated the radio charts of the 1960’s and 70’s. 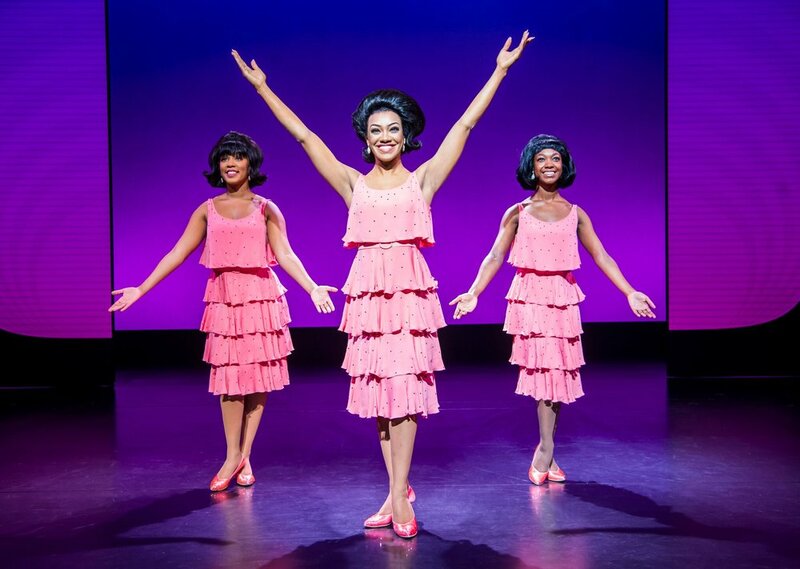 Written and adapted by Gordy from his published autobiography “To Be Loved”, the stage musical paints a picture of the man while presenting a procession of hit songs from the memorable Motown catalogue. It’s fast and it’s furious – and it’s feel-good fun. It begins with rehearsals for the 25th anniversary celebration in tribute to the man that discovered Motown – except that Gordy (here played by Edward Baruwa), despairing at his crumbling empire and angry at the stars who abandoned him for bigger contracts, has refused to make his appearance at the party. As friends and family arrive at his Hollywood home to plead with him to attend the celebration, he takes us back in time – via his memories – to show us how it all began. The flashbacks that follow give a glimpse into the professional and personal life of Gordy – including his romantic relationship with Diana Ross (played by Karis Anderson), his friendship with Smokey Robinson (Nathan Lewis) and Marvin Gaye (Shak Gabbidon-Williams), and his ongoing court battles with the song-writing team of Holland-Dozier-Holland. Running alongside his memories, is a fabulous soundtrack of familiar songs and sparkling dance routines. Edward Baruwa is superb as Berry Gordy with his immaculate vocals, and he is matched by Karis Anderson as Diana Ross, who perfectly captures the Supremes’ frontwoman’s journey to solo stardom. Other major players in the production include Nathan Lewis as Smokey Robinson and Shak Gabbidon-Williams as Marvin Gaye, who contribute to bringing the trademark Motown sound to the production with their distinctive voices. Many of the star turns, however, (the Four Tops, the Temptations, the Commodores, the Marvelettes, Rick James, Jermaine Jackson and so on, all the way up to Stevie Wonder) are featured roles taken on by the large and versatile ensemble cast. Among them, is the young Yami Mirazi who brings down the house with an amazing portrayal of Michael Jackson. The “The Love You Save/I Want You Back/ABC” medley was a definite crowd favourite. As a Motown fan, I absolutely loved this show but my one criticism is that I wanted more! All through, I thought it was building to the “Motown 25” show, and that we would see performances at the end from that iconic night, but instead, the show ended rather abruptly. “Motown 25” was where Michael Jackson performed ‘Billie Jean’ and Moonwalked in public for the first time and I can’t believe that not only did we not see the Moonwalk, but we didn’t see any sign of an adult Michael Jackson or any of his celebrated songs . It’s a glaring omission that made me go out on less of a high that I expected. Despite this personal disappointment, I’d still recommend that you go and see ‘Motown’. It’s well worth it.